In a world increasingly occupied by noiseless hybrids and diesels of bland design, the roads and circuits of Europe are threatening to become a duller experience every day. However, not all of the continent has succumbed. Somewhere in Brittany, one small village holds out against the might which is the 21st century stranglehold on the motor car. Yes, it’s easy to see the parallels between the unnamed fictional Armorican village from which Gaulic comic book hero Asterix hails and today’s very real Lohéac, a modest village a few dozen miles south of Rennes. 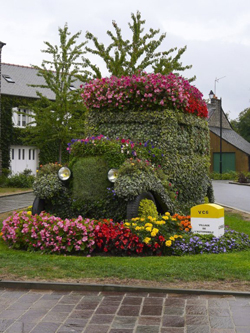 Lohéac would be just like any other village in Brittany, except for the fact that it has named itself the Village de l’Automobile. Solely responsible for the honourable epithat is the 17th century Manoir de la Cour Neuve, a typical Brittany manor almost literally hidden away in the woods surrounding the village. The difference is that this manor probably boasts the world’s largest in-house garage. 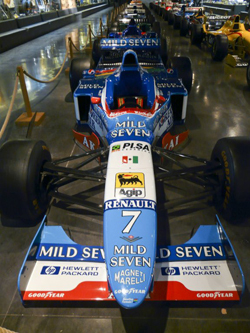 No-one would expect a museum of this magnitude in a place located as far away from everything else as this but yet there it is: over ten huge halls stretching to 14,000 square metres of exhibition space, harbouring over 400 of the finest and rarest vehicles you could imagine, including 18 Formula 1 cars. The manor garden is somewhat unusual as well, with its full-scale tarmac and rallycross circuits. (The rallycross track actually preceded the museum.) Back inside, the cars are surrounded by countless historic posters, badges and advertisement hoardings of the automobile and motor racing kind. The huge collection of toy models is breathtaking as well. It’s hard to believe that a mere two decades ago the Manoir de l’Automobile, which it is now called, was just a farm, its buildings stuffed with live animals instead of stationary vehicles. The Manoir is the brainchild of Michel Hommell, editor of well-known French motoring magazines such as Auto Passion and Échappement, and proud father of four children and a car of his own design, the Berlinette Échappement. When Hommell sought a place to house his ever-growing car collection, which he started when he was 18 years of age, he found it at Lohéac, the village where he had already introduced the art of rallycross. With the help of the locals Hommell transformed the manor into a startling museum devoted to some of the most beautiful (or interesting) cars in the world. 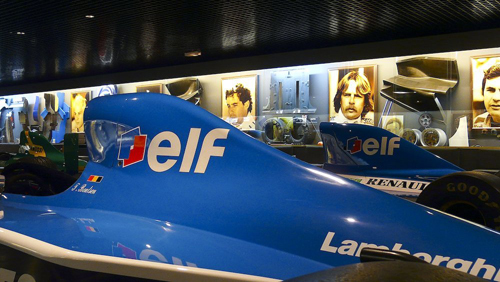 Top: The museum's F1 section shows France's rich past as a Grand Prix constructor. The main attraction for any fan of Grand Prix racing must be the space designed as a temple to Formula 1. 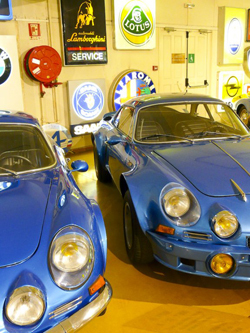 With its 18 cars, Lohéac houses one of the world’s largest F1 collections. A 1997 Alesi/Berger Benetton-Renault B197 forms the centerpiece, along with two protagonists of the turbo era of the eighties, Piquet’s Lotus-Honda 100T and the Prost/Rosberg McLaren-TAG MP4/2C. There’s another McLaren in the shape of the flawed 1980 M29, and a 1981 Osella FA1B but the majority of the cars hails from France: four Ligiers, three AGSs, two Larrousse/Lola cars, a Prost and a Matra. That only makes you realise what a powerful Grand Prix nation France used to be, whereas today the country doesn’t have a race, doesn’t have a constructor (if you discount Renault because of being based in England) and doesn’t even have one F1 driver. Surrounding the cars are a large collection of Ligier, Renault, AGS and Matra tidbits and some of the best known portraits of all World Champions to date. One other F1 car is in the Ferrari pavillion, the prancing horse’s ex-Tambay/Arnoux 126C3 from 1983. There, it is surrounded by a mouth-watering range of Ferrari road cars and an even more impressive amount of Ferrari models, both racers and road machines. The final ride of the man Tambay replaced at Ferrari is found around the corner, the awe-inspiring Colibri off-shore powerboat that killed Didier Pironi off the Isle of Wight. It is surrounded by the second Italian marque that Hommell was passionate about, Lamborghini. The bright red Miura in the collection sets off rather nicely against the raw might of the Colibri. 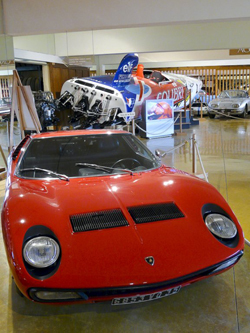 Left: Didier Pironi's Colibri provides dramatic backdrop to striking Miura. Le Mans and rallying get their deserved attention as well. The ex-Brundle Silk Cut Jaguar XJR11 and the Courage ‘Vaillante’ form centre-stage in the Le Mans section, along with the Manoir-sponsored Bugatti EB110 that raced at the Sarthe in 1994. One year later Hommell entered an Aston Martin DB7 DM, also on display at the Manoir. Audi’s quattro S1 rally car, the Peugeot 205 T16 Evo 2 and Lancia’s 037 and Delta S4 Integrale are the crowd-pullers in a rally section that frees up space as well for a failed project like the Citroën BX 14 TC Evo. All are surrounded by France’s glorious past as a car manufacturer, represented by great long-lost marques such as Alpine, Panhard, Matra, DB, Talbot, Delage and Delahaye and of course Bugatti, all the way down to the cradle – from De Dion-Bouton to Salmson. 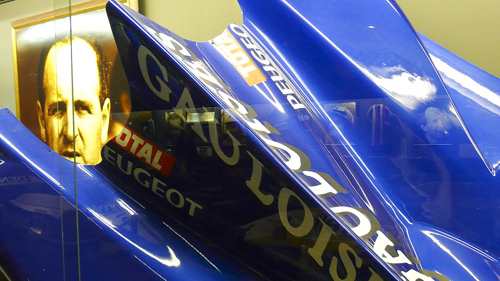 In another section, the manor presents the full history of the two French manufacturers that still remain – Renault and Peugeot/Citroën. A climb to the first floor leads to a overwhelming number of cars that didn’t fit to a theme. They are all there, side-by-side, from Facel Vega to Maserati, Porsche to De Tomaso, Simca to Austin, Trabant to Abarth. The top floor also includes a diorama presentation of the various kinds of craftsmanship that were common in the pre-automobile era. The horse-drawn carriages surrounding the displays show how their coach types – ‘berline’, ‘break’, ‘coupé’, ‘cabriolet’, ‘phaeton’, ‘jardinière’ – influenced the resulting French car design, their names still in common use to this very day. 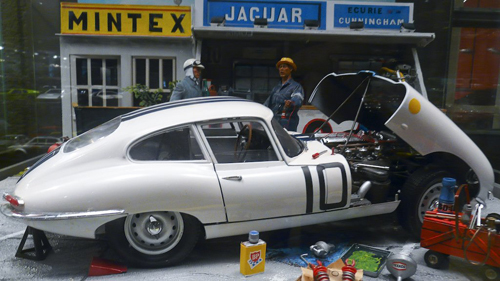 Top: The museum's scale model collection boasts separate displays for the most famous marques. If there one criticism we could make it’s that there is too much to see at once. In most of the rooms – with the exception of the Formula 1 hall – the cars are parked almost on top of each other, taking away the opportunity to walk around them and admire them from a distance. 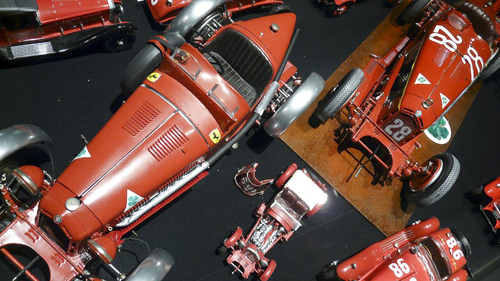 Still, you would be hard pressed to find a collection that is as rich as that of the Manoir de l’Automobile, perhaps with the exception of the Schlumpf Collection in Mulhouse. It takes a while to get there for almost anyone not hailing from Brittany itself but if you are in the area anyway it would be foolish not to take a detour. The Manoir is simply stunning.